At first the question the good folks at Highland Woodworking posed sounded a little strange..."What would you recommend as a 'first Festool' purchase?" Logically, anyone's first Festool would be the tool they need the most, right? Everyone has a drill, a circular saw, a router, a sander or two, and a chop saw, so the first Festool anyone would buy would be both an upgrade and a replacement for something that is worn out, broken, dead, or dying. But upon further reflection, that's not strictly true. People might want to (and often do) buy a Festool product because of what they have heard about the tools, what a friend has said, a review they have read, or even what some YouTubers have demonstrated. Some just want to see if all the hyperbole is true, some might want to see if there is truly a substantive difference between a low-buck box store power tool and a high-buck Festool. 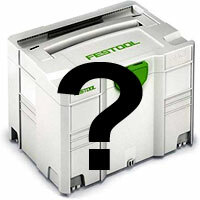 So, whether it is "need" or "want," the question is legitimate...what should be your first Festool purchase? My answer to that question is surprising...perhaps even a little bit crazy. But I feel strongly that the first Festool tool a person should buy isn't a tool at all, but instead, a dust extractor. I will attempt to explain my reasoning. Remember, everyone has a drill, a circular saw, a router, a sander, a chop saw, and more. And they all seem to be in good working order. If you replace one of those tools with a Festool, you can make a direct comparison, true enough, but if you are a part time weekend warrior woodworker (as many of us are), you don't use every one of those tools every day. Maybe you drill a hole once a week, use your router once a month, sand only when you have finished building a project. You might use your chop saw more frequently, but not every day. A shop vacuum, though, is used every single time you are in the shop. Maybe you use a shop vacuum for dust extraction, maybe you use it to clean up after a day of woodworking, but you use it every day. Comparing your old shop vacuum to a Festool Dust Extractor will give immediate, tangible, verifiable comparison impressions and data. Turn a Festool Dust Extractor on for the first time and you will immediately notice how much quieter it runs than your big-box store shop vacuum. You probably noted the heavy-duty power cord that is thicker than the cheap brand's but more flexible. Notice how easily a CT Dust Extractor (of any size) rolls across the floor and the hose doesn't fight you all the way. Notice how the anti-static hose stays cleaner and flexes with such ease. Play with the variable speed...no cheapo big-box brand has that. Try out the tool-triggering function...way cool. Then open it up and check out the HEPA filtration and the nicely fitted, easy-to-change collection bag. You will use this "tool" every single day in your shop and within a very short time you will deeply understand the attraction of Festool and why so many professionals literally "bet their careers" on these tools. The Dust Extractor will introduce you to a world of tool engineering and design expertise you never knew existed. By the second or third day of using a Festool Dust Extractor you will banish your old shop vacuum to the garbage, Goodwill, or your least-favorite nephew, and you will never look back. You will be "hooked." The experience would be the same with a drill, a router, a chop saw, or a circular saw, but it will take longer to fully appreciate the profound differences between your old tool and your new Festool, simply because you don't use those tools every day. So, my logic is, replace the piece of equipment you are most likely to use every single day first. It will speed up your conversion "mindset." In my own experience, my first Festool purchase was a dust extractor and a sander package deal. 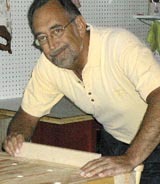 For several weeks I was "ho-hum" about the sander. Okay, it sands. It was smooth. It stopped spinning quickly. And it seemed to do a nice job. But hey, the last thing I sanded was a few weeks before, so a direct comparison was difficult. But the dust extractor (vacuum) was an all-out hit from day one. I enjoyed using it so much, I found myself using it more than any shop vacuum ever. Of course, over time, I realized that the Festool sander was vastly superior to my old random orbit sander. Ultra low vibration makes it less tiresome to use, the scratch pattern regardless of grit was less defined, and when coupled to the Dust Extractor, it was dust-free nirvana. Now I have five Festool sanders in different configurations. But it took time to come around to the realization that a superior power tool is truly worth more money...wasted time, in my opinion. In full disclosure mode, I also now have three Festool Dust Extractors, three Festool drills, two Festool routers, a Festool Domino Joiner, the TS55 Track Saw with a bevy of rails and attachments, two Festool jig saws, the Festool Kapex miter saw, a Syslite and even a Sysrock. If you don't have any Festool tools, but are just a little bit curious, buy a Dust Extractor and replace that noisy, dusty, inefficient beast of a shop vacuum you hate to use. The experience will change you and make you a Festool fan. And don't be surprised when you max out the credit card, rob the kids' college fund, and thoroughly annoy your spouse by buying more Festool stuff. I warned you.